STILLWATER, MINN. — Warren MacKenzie, an iconic and distinguished figure in the history of ceramic art and among the most collected American artists of the Twentieth Century, died peacefully at home in Stillwater on December 31. He was 94. MacKenzie’s utilitarian pots are featured in museum collections worldwide, from North America to Europe to Asia. 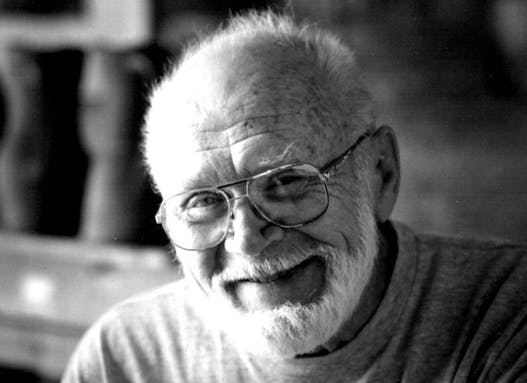 Born in Kansas City, Mo., in 1924, MacKenzie grew up in Wilmette, Ill. His interest in pottery was borne of a fluke. In 1946, he enrolled at the School of the Art Institute of Chicago. He was 22 and had just returned from World War II. He tried signing up for painting classes, but they were all full. He took ceramics instead but found himself frustrated by the focus on technicality over aesthetics. When he was given a copy of Bernard Leach’s A Potter’s Book, he was inspired by the potter’s philosophy of making objects of utility and simple beauty. MacKenzie apprenticed with Leach in St Ives, England, from 1949 to 1952 with his first wife, Alix. From there, they moved to Stillwater, converting an inexpensive barn into a ceramics studio. The couple threw between 50 and 200 pots per day, constant collaborators until Alix’s death from cancer in 1962. They had two daughters, Tamsyn and Shawn. MacKenzie remarried in 1984 to textile artist Nancy Spitzer. She passed away in October 2014. Driscoll Babcock gallery, which represented MacKenzie, said, “We were honored to work with Warren over many years, hosting three solo exhibitions as well as an exhibition titled ‘American Shino’ in which Warren had the central role and an exhibition of six modern masters (Bernard Leach, Hamada Shoji, Warren MacKenzie, Shimaoka Tatsuzo, Randy Johnston and Matsuzaki Ken) celebrating the 75th anniversary and lineage of the Leach Pottery, St Ives, England. In addition to his daughters, survivors include the children of his second wife: Erica Spitzer Rasmussen and Mark Spitzer.